Oktoberfest has a long tradition that started in Munich 200 years ago. We celebrate that the harvest is gathered. When you get to the tent, you will feel like you are in Munich. Blue and white are the colours that characterise an authentic Oktoberfest tent and our waitresses and waiters are dressed in Dirndl and Lederhosen because that’s how we dress at Oktoberfest. The tent will be filled with long tables, we serve a lovely 1 liter beer that is brewed for Stockholm Oktoberfest and it is certain it won’t be long till you feel like singing along and standing on the benches. It’s the genuine Oktoberfest – sing along and just socialise – a motto that guarantees a great evening. Our beer is brewed according to the German Reinheitsgebot (German Beer Purity Law) and is 5.0% vol. 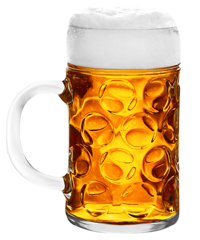 – Oktoberfest beer you’ll love. Entrance is free, but if you are coming with friends or colleagues it is a good idea to reserve space with our beer and food offers. The tickets are between kr. 415 and 485 and includes: snacks, seat reservation, 2 liters of beer or 1 bottle of red / white wine, Bavarian “Schnitzel Teller” and dessert. In 2011 we launched the first Oktoberfest in Stockholm and we are now the best Oktoberfest in town. Many come dressed in dirndl and lederhosen which adds to the great atmosphere. You can buy traditional Oktoberfest outfits at the following link www.lederhosen-shop.net. Additionally, we offer the possibility to rent clothes for the evening directly in the tent (both Lederhosen and Dirndl). It only costs kr. 350 plus an additional kr. 300 deposit which of course you get back when you hand the clothes in. The clothes rented in our shop and your clothes can be kept in our wardrobe for free. The event is subject to license. Book a ticket and be sure of a seat. Cancellations made prior to July 15 there is a charge of kr. 125. From July 16 prepaid tickets can not be canceled. Tickets will be refunded only in the event of flight cancellations or force majeure. Wardrobe: We offer a wardrobe for a fee, but generally it isn’t a good idea to take valuables with you to the tent. We accept all cards. VAT is 20% of the total. Participation in the Oktoberfest at your own risk. Stockholm Oktoberfest is not responsible for errors relating to prices and other information. Subject to changes.